THE QUALITY DIFFERENCE: Beauty Beyond Belief is a small, family-owned company helping you. 8 eBOOK EDUCATION SERIES: A Gardener's Guide to Pollinators, Organic Pest Control, A Beginners Guide to Gardening, Getting Started with Seed Saving, Succession Planting, Fall Wildflower Seed Planting and Our Favorite Recipes! 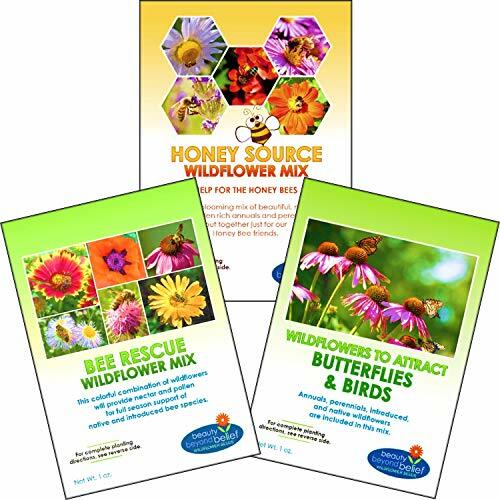 BEE RESCUE MIX: 27,000 seeds (1 oz) for lush coverage of over 100 square feet. Nemophila menziesii, Monarda fistulosa, Linum perenne, Eschescholzia californica, Callistephus chinensis, Cynoglossum amabile, Papaver rhoeas, Erigeron speciosus, Gilia capitata, Coreopsis lanceolata, Layia platyglossa, Gaillardia pulchella, Coreopsis tinctoria, Echinacea purpurea, Cheirantus allionii, Lobularia maritima, Agastache foeniculum, Aster novae-angliae. BUTTERFLIES AND BIRDS MIX: 33,000 seeds (1 oz) for lush coverage of over 100 square feet. Mix includes: Lobularia maritima, Echinacea purpurea, Rudbeckia hirta, Centaurea cyanus, Coreopsis lanceolata, Coreopsis tinctoria, Callisterphus chinenis, Linum perenne, Iberis umbellata, , Cleome serrulata, Ratibida columnifera, Rudeckia gloriosa, Delphinium ajacis, Asclepias tuberosa, Gaillardia aristata, Gaillardia pulchella, Cosmos bipinnatus, Cosmos sulphureus, Lupinus perennis, Helianthus annuus, Monarda citriodora, Clarkia amoena and Zinnia elegans . If you have any questions about this product by Beauty Beyond Belief, contact us by completing and submitting the form below. If you are looking for a specif part number, please include it with your message.